I've never tried capers, have you? When I saw this recipe i thought it would be an interesting opportunity to try em. My mother told me you should always buy capers that are packed in salt, rather than in brine. They are harder to find, but supposed to be best. You just have to give them a good rinse before using. I found this recipe in Martha Stewart Living. One of my all-time-favorite magazines. Preheat oven 450 degrees. Toss together cauliflower, onion, capers, and olive oil. Season with salt and pepper. Spread vegetables in a single later on a rimmed baking sheet. Roast, stirring halfway through, until cauliflower is tender and browned, about 40 mins. Meanwhile, bring a large pot of water to boil. Toss in a pinch of salt when water boils. Add pasta, cook until al dente, according to package instructions. Drain. Toss hot pasta with parsley, lemon zest and a squeeze of lemon juice. Add olive oil too if desired. Add cauliflower mixture and gently toss to combine. Serves 4-5. I'm not an olive lover myself. I wasn't a huge fan of the capers. Overall I thought the pasta was okay. A little blah. I could tell immediately a couple things I would do differently. I would add toasted pine nuts, basil or tarragon instead of parsley, and possibly roasted grape tomatoes or sun dried tomatoes. I tend to like things full of flavor. I would say though, that it is a light and fresh recipe which I can appreciate. Any suggestions? Anyone know of any good recipes with capers? I still have half a bottle. It's Memorial Day. Every year my dad holds the American Flag in the veteran's ceremony in our town. He served in the Marines during Vietnam. After the ceremony, we get cooking. 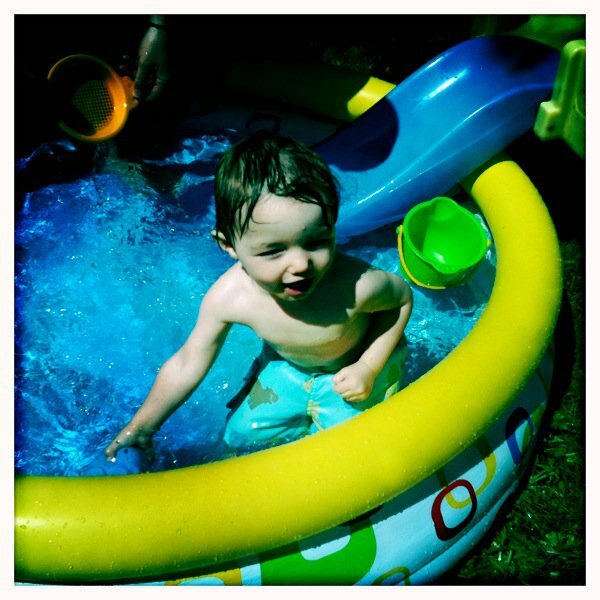 This year my 2 year old nephew, Ko, wanted to do nothing but get in his kiddy pool. Meanwhile, my mom and I were busy in the kitchen; Dad was trying to get the propane tank working; My sister and her husband were trying to keep up with Ko. We grilled out as usual. Grilled bbq tempeh, corn on the cob, grilled potatoes, and homemade vegan ice cream. It was a perfect start to summer. Preheat grill. Place potatoes in a medium size bowl. Add a little salt, pepper, and just enough olive oil to lightly coat the potatoes. Add more if needed. Bring to grill. Place grill pan (or foil) on hot grill and dump potatoes evenly. Shut lid. Turn potatoes over as they brown. Cook until knife tender. Place potatoes in serving bowl. Toss with thyme. Enjoy! I hope you had a lovely Memorial Day filled with memories, laughs, wonderful food, and sunshine. Last summer I spent a week in the Darien jungle in Panama for a missions trip. It was amazing to bring the love and truth of Jesus Christ to these people. Since then, every time I see plantains, I miss the food they prepared for us. I stumbled on this recipe for curry which I thought would go well with these plantains. They turned out very good after I got the hang of it. Heat the water in a large saucepan over med-high heat. Add onion, saute 3 mins or until tender. Stir in curry paste; cook 1 min. Add 1/2 C. of the broth, carrot, ginger, cayenne pepper, and garlic; cook 6 mins or until carrot is tender, stirring occasionally. Add 3 1/2 C. of remaining broth, lentils, and soybeans;to a boil. Reduce heat, simmer 10 mins or until lentils are tender. Add salt and pepper to taste. Right before serving add cilantro and pour into serving bowl. Serve coconut milk or yogurt on side for optional use. Serves about 6. Use very green plantains. Rinse and cut both ends off. Make a cut starting from the top, so you can peel it open. The skins are very thick, unlike a banana. You may have to cut it more than once. When finished cooking, using a fork, remove and drain on a paper towel-lined plate. Taking one at a time, using a plate, slowly flatten fried plantain slice. I used a pancake turner to remove the delicate slices from plate. They tend to stick to the plate. (If it's falling apart, you may have not cooked it long enough.) Return flattened slices to frying pan and cook on each side for 1-2 mins, until lightly browned. Drain slices on a paper towel. Serve with sea salt. YUMMM! I hope you try it. I love to make ethnic food. It was a very flavorful and different meal. Very easy curry to make. The plantains took quite a bit of work and time. I think there are probably easier ways to prepare them. This was my first time. I'll try something else next time. Have a great night. That's right. It's girls night out. So naturally we head out to Godiva! We are all Godiva Reward's Club member so we get a free piece of chocolate each month. It's perfect! The case was full of bright pastel truffles popping out and begging us, "Try me, Try me!" Such a hard decision. The woman Chocolatier was so welcoming and made us feel pampered. We each indulged in our delightful choice and moved on to the next adventure. So many choices.. so hard to decide! Yum!! Pistachio. One of my new faves! We went to Noodles and Company for dinner. I really like the options they have for vegetarians. Vegans, I'm not sure. I need to look up the ingredients. I had the Indonesian Peanut Saute with tofu. Deee-licious! Bellies full of chocolate, we thought it was about time to wrap the night up. We discussed worst pick-up lines, most romantic surprises, and funny date stories. What a great night. Tonight, by high demand from my dad, I made the Grilled Pizza recipe, but this time vegan. I was out of basil so I used cilantro instead. I omitted the cheese and topped the pizza with fresh thyme and mint. It was very yummy. I was craving a fresh salad so I served a romaine and mango salad with mango balsamic dressing along with the pizza. For dessert I tried a recipe from Isa Chandra Moskowitz's cookbook. The cookies turned out perfect. Crunchy edges, chewy center, oaty and satisfying. I used creamy peanut butter instead of crunchy though. I will definitely make them again. They were very easy and quick to make! A cold glass of iced tea is fabulous with a fresh out-of-the-oven cookie! Preheat oven 350. Lightly grease cookie sheet. In a bowl, mix flour, oats, baking powder and salt. In a large bowl, mix oil, peanut butter, sugars, soy milk, and vanilla extract. Add the dry to the wet and mix. The dough will be very firm and moist. To make Large, perfectly round cookies, pack 1/3 measuring cup with dough, pop out, and roll into a ball. Flatten with the bottom of glass or your hand into a 1/2" thickness. Leave enough room in between cookies because these babies get BIG! Bake 12-14 minutes until edges are lightly browned. Allow about 10 minutes for cookies to cool before removing from cookie sheet. You can also make normal sized cookies if you'd like. I use a small ice cream scoop with a spring. It's so easy to use! Bake the smaller cookies 8-10 minutes. So grab yourself a glass of fresh brewed refreshing iced tea, sit down and savor each bite. On a rainy day, what's better than going to your favorite coffee shop, grabbing a toasty cup of joe and day dreaming with a book? Or how about slipping on your apron, turning up some Sufjan Steven's Avalanche, and preparing a warm welcoming meal for your family? That's how I spent my evening. Tonight's extravaganza was Butternut Squash Enchiladas, Guacamole and Chips, followed by Almond Butter-Cream-Stuffed Snickerdoodle Sandwich Cookies (thanks to Rachel Ray). Would you like to join us? I tweaked the original recipes to accommodate a vegan diet. Since seeing Forks Over Knives we are all trying to stay away from animal protein and oil as much as possible. I highly recommend watching the movie and if nothing else, watch the trailer. Believe it or not, it could drastically change the way you see food and it could save your life, along with the many others that have added decades to their lives, as seen in the film. Preheat oven 350. Place squash cut side down on baking sheet lined with foil. Roast 45-60 mins, until soft. When cooled enough to handle, scoop out squash into bowl, leaving chunky. Set aside. Heat water in saucepan over medium heat. Add onion, saute 5-7 mins or til soft. Add chipotle, adobo sauce, and garlic. Cook 1 minute, stirring often. Stir in squash, beans, cumin, and nutmeg. Cook 3 minutes more, til heated through. Remove from heat and fold in green onions. Spread a thin layer of enchilada sauce over bottom of a 13x9" baking dish. Lay tortillas on a baking sheet and warm 3 minutes in oven to soften. Fill each tortilla and roll loosely, placing in baking dish. Top with remaining enchilada sauce. Bake 30 mins, or until top begins to brown and sauce is bubbly. The truth is no mexican meal is complete without these two! The dinner was well received! I had a request to bring in leftovers to my co-worker. So as soon as the kitchen was cleaned up I brought her a plate. A squeeze of lime and chopped cilantro add an amazing touch! Jennifer very excited and delighted! I make simple guacamole: Mash avocado with a fork. Top with cilantro, sea salt, cracked pepper, and a squeeze of lime. mix but leave chunky. These cookies were unusually delicious! These cookies were amazing!! They would be good even without the filling and were very easy and quick to make. If you're interested in the recipe, I'll post it. As Andy Griffith would say: I appreciate it and goodnight!